This sequence and next: Two of our protagonists meet a third under less-than-ideal circumstances in the first volume of Klezmer; ©2005 Gallimard Jeunesse, translation ©2006 First Second. 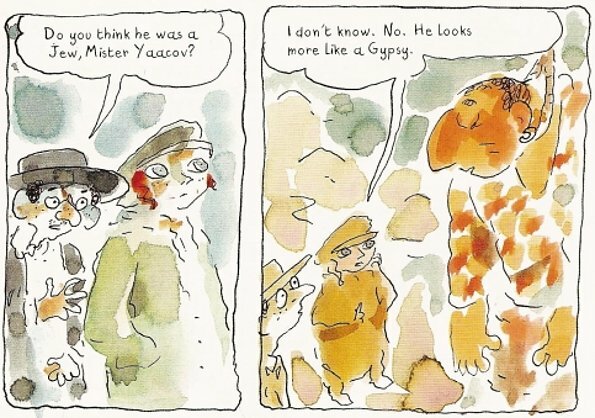 Drawn in a jazzy, impressionistic style familiar to Sfar fans everywhere, Klezmer Book One follows the trials and tribulations of five musicians, all but one of them Jews, as they wander the lawless wilderness of pre-WWII Eastern Europe, down on their luck and hoping for a break. A superhero fan would probably call this an origin story; the various characters slowly meet up throughout the course of the book, united at the end only to stare at the "continued next issue" caption. Not that there isn't plenty of story along the way, of course. By making his protagonists Jews and Roma and placing them in a time and place when bloody progroms against such minorities were an omnipresent fact of life, Sfar is able to provide plenty of genuine danger for them to dodge, and while he's too smart a storyteller to overplay the scenario into mere melodrama, Sfar nonetheless makes sure that the reader feels the ominous overtones at every opportunity. 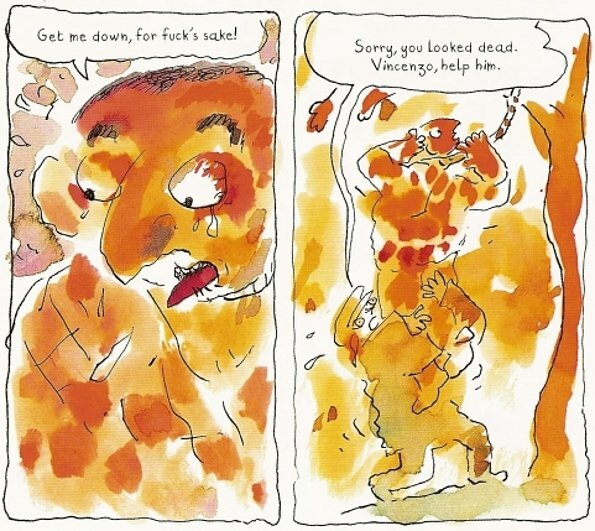 As is often the case with Joann Sfar comics, it's the art that ultimately sells the story. His deceptively loose, cartoony style draws the reader into the action, and his firm command of gesture and emotion makes sure the reader cares about what happens next. Each character steps into the frame seemingly fully-formed, motivations and personalities obvious without quite feeling telegraphed to the point of stereotype. The expressive coloring schemes shift cleverly from scene to scene, adding to the mood as required. The book seems a bit too short, but that's its sole shortcoming, and a forgivable one at that. There's a reason that Sfar's works are so wildly popular in his native France, and Klezmer Book One: Tales of the Wild East, like The Rabbi's Cat before it, will leave English-speaking readers as impatiently awaiting more as any true-blue bande-dessinée fan. Fortunately, we have Klezmer Book Two to look forward to reading soon.